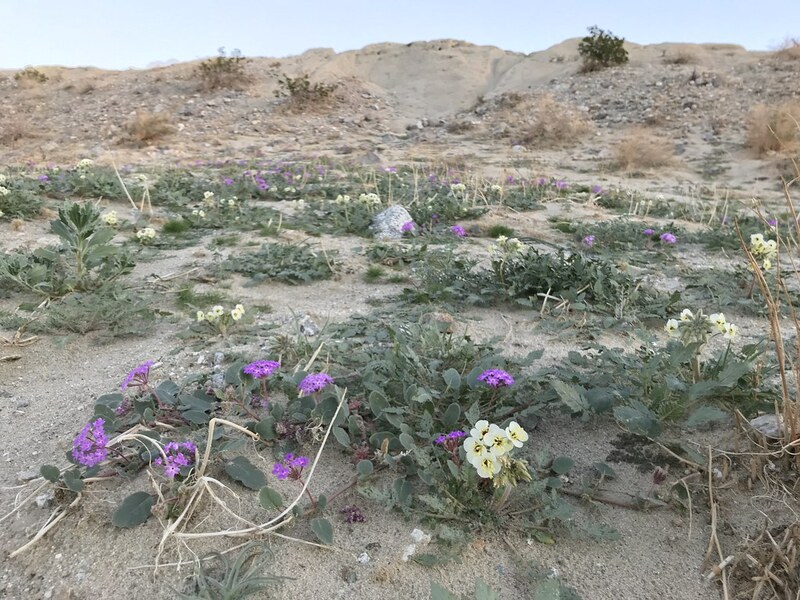 Latest flower reports from Anza Borrego. Looks pretty good so far! 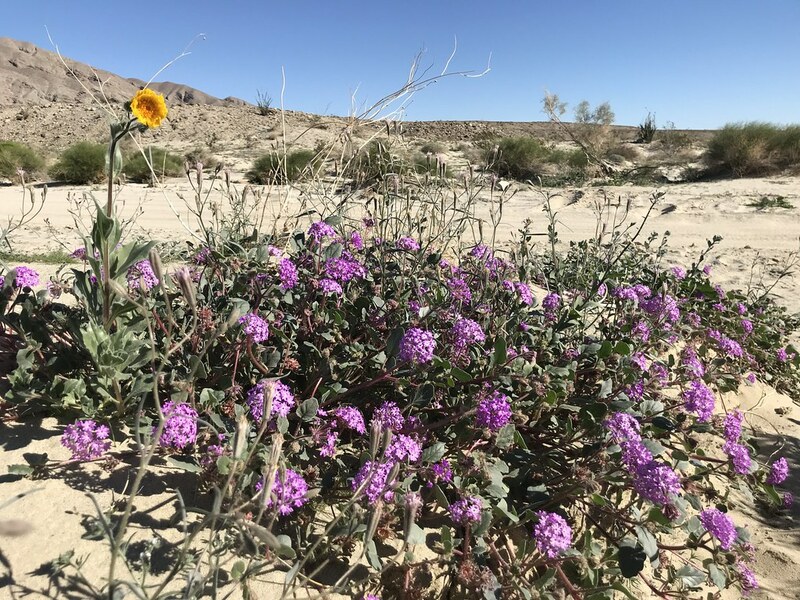 Both Anza-Borrego and Ocotillo Wells have had lots of flowers appearing. Figured it would get pretty nice over the next few days...wish I could get out there, gonna post any pics?? I bet the little sandy wash flowers are gonna come up all over the place. It’s been good since mid December in some areas. I’ve been out at least every 2 weeks. I’ll post some pics up later. I’m worried it could turn into another disaster like a couple years ago. We were out Sunday night for the super-moon. Found some flowers when we were heading up S2 near Inner Pasture. Looks like it could be a good bloom this year. Nice...I need to get out there! @surfponto I was in that area the weekend before. It was starting to look promising. The usual flower fields near Henderson and Coyote were devoid of flowers for now. Great picks. Love the rain! Getting out soon. For some I reason I can't remember now, I missed that whole Flowergeddon mess, instead I remember enjoying the blooms closer to home. There were several local AB events that were postponed or even cancelled due to that Flowergeddon mess. 2 hour lunch lines in town. It was a train wreck of epic proportions for Flowergeddon. I had planned on going that day with some friends a couple months ahead of time because there are always some flowers mid March. As the day approached, we knew it would be crowded, but what we saw as a whole other level. Dudley’s had a big line before opening. Before 9:00 am Montezuma had cars parked from before the Hellhole parking lot all the way to Christmas circle on the roadside. The Hellhole lot was jammed. The flower fields were a mess. There were less people in the Badlands and still a good flower show. We were eating lunch in the badlands and someone pulled up all in a panic asking where to see flowers. Uh, everywhere, look up. On the way home, S2 was completely stopped and backed up all the way from Montezuma grade to the stop sign at the 79. If it is anything like last year, stay away from Borrego Springs and Henderson Canyon Road. Everything else wasn’t too bad. Heading home via S2 to I8 would be smarter. I went back a couple weeks later to a different area of the park and the cacti blooms were spectacular and no one was around. There had been some good blooms in prior years with no where near the mess as 2017. I am afraid what happened in Flowergeddon might be the new normal for a good bloom. There are still plenty of quiet places in Borrego, even with the crowds. Most are car tourists who never walk more than a few hundred yards from their car. I believe there was a NY Time article last year that help fuel the fire. Where are the majority of the blooms happening? I was just at Blair this weekend and while everything is green I didn't see any flowers. Usual popular areas of blooms are around Henderson Canyon Road and the alluvial fans that drain the Ysidro’s. Other areas can be just as good with less people. Looked promising a couple days ago, but still not full speed yet. There is a disheartening amount of Sahara Mustard around, including remote spots. Good to see it is being weeded out in some areas. Going to head out Saturday for the night and explore the Canyon Sin Nombre area to see what we can find. Coyote Canyon was not great last weekend. Some little flowers. Sand Verbena and Brown Eyed Primrose were out in force. Sunflowers were starting but not blooming in numbers. Some of lookers starting to stop in the middle of the roads. Coyote Canyon rain gauge got >2.5” yesterday. No surprise the road is closed due to flooding. Every Wednesday I pull invasive plants in the park. Get to see lots of flowers! We were pulling them up in Coyote Canyon, but it was closed because of safety. Just today it opened up to Desert Garden. There are a lot of flower seekers now. Henderson Canyon doesn’t have much to see right now. The Sand Verbena is spectacular on S-22 from Clark Dry Lake to the middle of the Badlands. 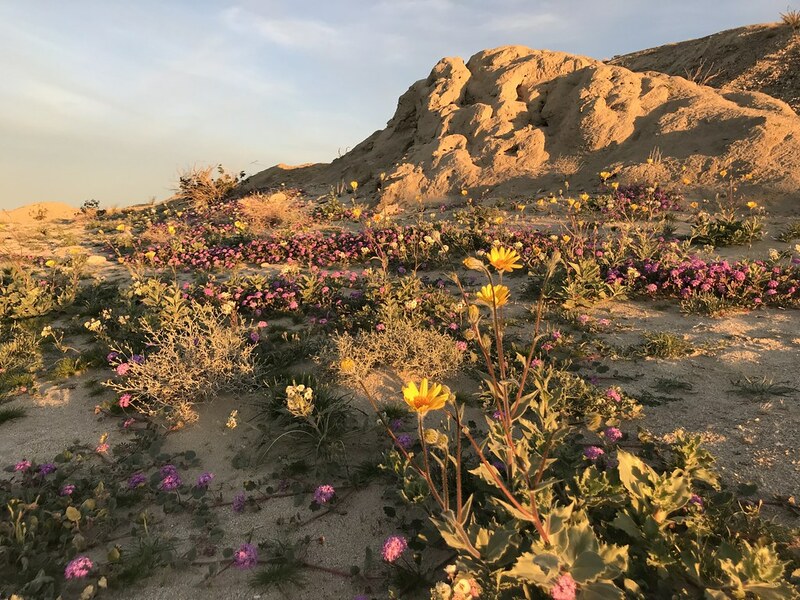 Living in Borrego is great, but the Flowergeddon period was not so great! I wonder if one of the next two weekends will be flowergeddon? I hope not.